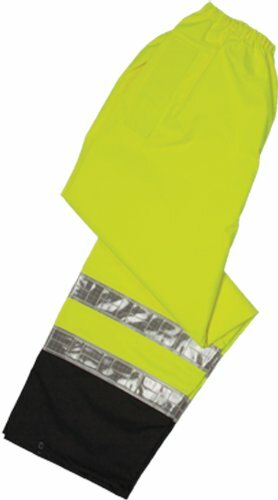 ML Kishigo Reflexite storm stopper pro rainwear pant. Reflexite prismatic reflective tape performs exceptionally well under wet conditions, and provides additional durability over silver glass beaded reflective materials. Weather resistant breathable material with sealed seam construction keeps the wearer warm and dry. Black lower body and sleeves help keep the wearer's appearance neat and clean. ANSI/ISEA 107 class E compliant. Lime color. Size: large and extra large. Chicago Protective Apparel, Inc. 606-IND-DNM Chicago Protective Apparel Flame Resistant 14 oz 100% Cotton Relaxed Fit Jeans, 42 x 36"